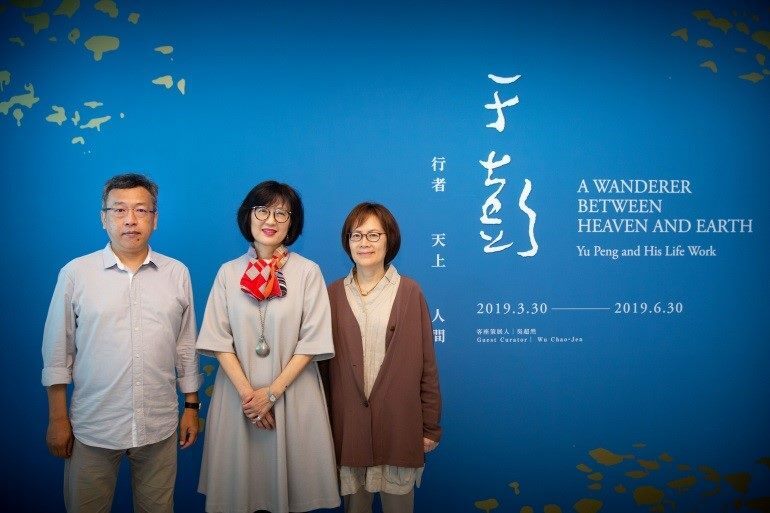 Yu Peng’s retrospective exhibition A Wonderer between Heaven and Earth: Yu Peng and His Life Work will officially open to the public in the galleries on the 2nd floor of Taipei Fine Arts Museum (TFAM) on March 30, Saturday. Organized by guest curator Wu Chao-Jen, the exhibition will showcase more than 170 pieces of work after nearly 5 years of preparation. Besides Yu’s well known ink painting diptychs, the exhibition will also display his documents and artworks in different stages of life, including oil paintings, pastel paintings and sketches, which is going to be the largest retrospective exhibition in Pan-Asia in recent years. Born as Wu Kun-Ren, Yu Peng (1955-2014) was born in an area along Taipei’s Waishuang Creek. During senior high school, he was inspired by his art teacher Chen Yi-Keng and attempted to major in art in college. After his failure in the college entrance exam, he set out his unique life journey in artistic creation. Without formal training in academic art, Yu used his own approaches to learning and left the world with entertaining anecdotes. For example, after his failed to attend college, he set up his stall in Taihoku New Park (now 228 Peace Memorial Park) as a portrait artist during 1977 to 1980. Three years of extensive observation and practice helped him build a solid foundation in making portraits, which also became an essential theme throughout all stages of his creation. The curator shared a romantic anecdote in particular that it was during this period that Yu met his wife Hou Chun-Li. Curator Wu Chao-Jen has divided Yu’s art career into 3 stages: the early-stage from 1980 to 1997; the middle-stage from 1998 to 2004, and the late-stage from 2004 to 2014. During the first stage, the artist shifted from his early sketch and watercolor works to the exploration period of ink paintings. Yu Peng’s ink painting style was not inherited from his family nor acquired from a certain teacher; rather, he intentionally learned his techniques from classical ink paintings during his exploration period, imitating works from the Four Masters of the Yuan dynasty to Four Monk Artists of the early Qing dynasty. Such self-training in classical ink painting had a great impact on his ultimate painting style later on. 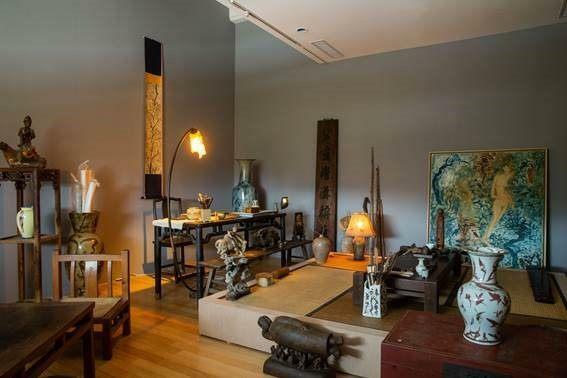 In 1997, Yu was invited by his friend Cheng Tsai-Tung to visit Shanghai and stayed there for 3 years during which he feasted his eyes on Chinese gardens as well as natural landscapes in Jiangnan. The overlapping landscape formations along with the juxtaposition of human figures with Chinese gardens in the composition of his paintings were inspired by his experiences throughout the journey. Many of Yu’s distinguishing elements in art grew mature during the period, and thus the curator designates 1997 as the turning point in Yu’s life. After Yu Peng returned to Taiwan, his travel experiences continued to play a role in his artworks and his life. The symbols in Chinese gardens were the most common elements in the background of his paintings, with his young son in the form of a putto appearing between the Chinese landscape. Yu sought inspiration from the physical world to create fantastic landscape paintings, and ultimately reached his maturity in style around 2000, in the final years of his middle-stage in his art career. His creations in the late-stage centered around his social life with artist and literati friends as well as his health conditions. Yu’s works Drops of Blood as Red Fruit (2009) and his last painting on his deathbed Self-Portrait: Illness (2014) will be exhibited this time, presenting the artist’s decision to face his twists and turns in life with art creations rather than deliberately euphemize or avoid the issue of life and death at the critical moment of his survival. The exhibition follows the 3 stages in Yu’s art career and divides the exhibition area into 8 thematic sections, including: (1) sketches, pastel paintings and oil paintings in the early-stage (2) calligraphy works and album leaves (3) ink paintings in the early-stage (4) large-scale ink painting diptychs (5) oil paintings and ink paintings in the late-stage (6) sketches, pastel paintings and oil paintings in the late-stage (7) documents, private letters and documentary films for the exhibition (8) a simulation of Yu Peng’s studio, displaying his furniture and painting materials. In addition to exhibiting Yu’s typical styles in different stages throughout his life, the 8 thematic sections also comprehensively display his unique life journey and creation concept through a thorough review of his life and his intimate writings. Artist Yu Peng was both tenacious and carefree, and his idiosyncrasy can be appreciated from his paintings, which will always be remembered and revered by all. Curator Wu Chao-Jen stressed that this exhibition by no means aims to emphasize the legendary life of Yu Peng; on the contrary, the exhibition is expected to faithfully unfold the real Yu Peng and his art pieces through reviewing his life under the context. Yu once stated, “I’ve exchanged my life to fulfill my art.” This retrospective tries to demonstrate the distinct issues as well as the quintessential works of art in different stages throughout the artist’s life and share his lifelong determination in creation to the public. TFAM specifically invited Yu’s old friends, writer Hsu Hui-Chi and artist Lin Chaun-Chu, to host “Art Promenades” respectively in April. As they share their stories with Yu Peng to the audiences, their touching friendship will help the public better relate to the artist, bringing warmth to the retrospective. TFAM welcomes all visitors to actively join related activities. For more details, please go to TFAM official website (www.tfam.museum) or follow TFAM Facebook page for latest updates.